It's Monday morning and your mom is shaking you awake. It's a rough way to wake up especially knowing a full school day is ahead of you filled with learning, reading, and writing. Blech! School is exhausting so you're already dreaming of crawling back in your cozy, warm bed, but at least there's a silver lining in all of this; your Bigfoot paw slippers. Waking up means putting them on and they're like fur-covered pillows for your feet; every step feels like you're stomping through a cloud and it's magical. 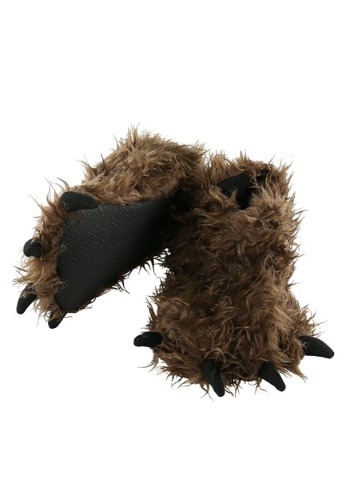 Monday morning is a lot less scary thanks to these Bigfoot slippers. You're a walking urban legend in these. Pro tip: traipse through the woods and create a mystery in your very own backyard. Made from a cotton/poly blend, these slippers are soft-to-the-touch and extremely plush since they're filled with stuffing. Covered in furry, brown hair these slippers also feature stuffed claws on the end while grippy bottoms help with traction just in case you're really thinking about wearing them outside. In addition to being a bedtime accessory, these slippers accompany any of our Made by Us Bigfoot costumes so you'll have a head-to-toe look.